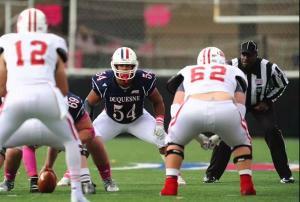 Nate Stone has started every football game Duquesne has played since he arrived on campus as a freshman. Currently a junior, Stone is second on the team with 42 tackles and has added a pair of forced fumbles. The decorated linebacker does not just excel on the field, however. Stone was also one of 20 Dukes named to the Northeast Conference Fall Academic Honor Roll last year. This distinction is earned by players who maintain at least a 3.2 GPA throughout the fall semester. Stone, a Greensburg Central Catholic graduate, admits it is challenging sometimes to balance the workload of school and football. He said the key is to plan ahead. “If you stay ahead and get your work done, and study piece by piece, it's a lot better than trying to wait until the last minute and rush everything,” he said. 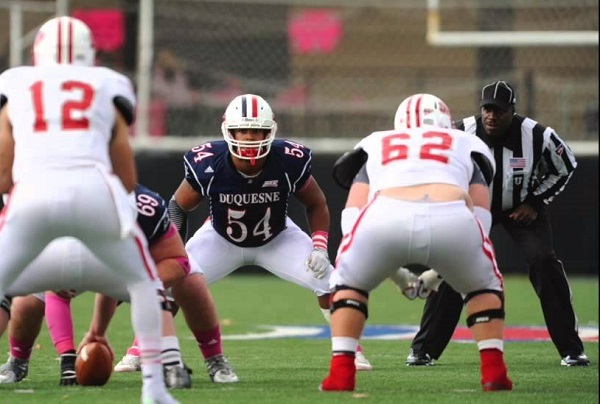 Tyler Scudder, the linebackers coach at Duquesne, said Stone’s success on the field is a testament to the amount of time he invests into preparing. Stone said his two favorite games were last year’s NEC Championship game, in which the Dukes captured their first solo conference championship, and his first ever start as a freshman at Buffalo. He finished the game with 12 tackles and a sack, and went on to win the NEC Defensive Rookie of the Year award that year. Scudder said he thinks Stone’s best quality is his intensity that goes into everything he does. He added that Stone's dedication to working out and taking care of his body is a large factor in his ability to stay healthy enough to not miss a start. Stone said he's hoping the Dukes, currently 4-2 overall and 2-1 in the NEC, can repeat as conference champions, but he believes in taking it one game at a time.